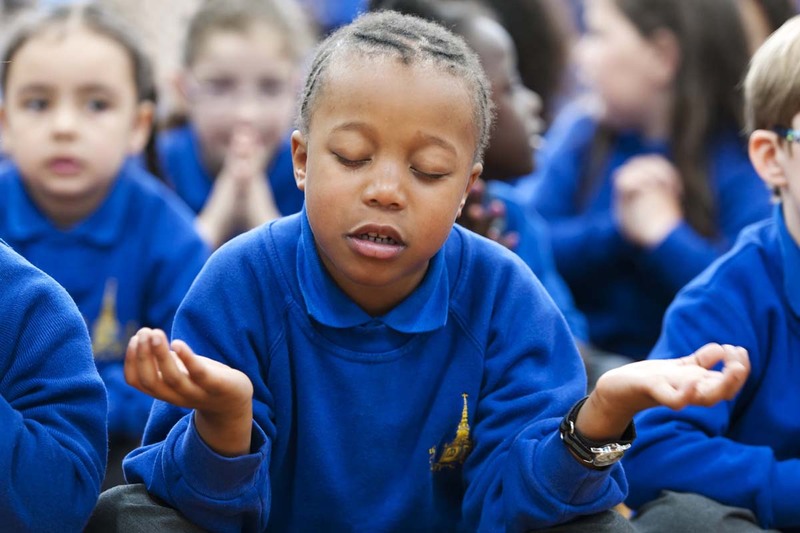 A whole school collective act of worship happens every day. Worship is a very important part of our school day and we aim that this is evident in our daily worship assembly. Worship is planned half termly by the collective worship co-ordinator in partnership with clergy and the Headteacher. These themes may be related to particular festivals that occur throughout the church calendar or those of other faiths. They are related to areas of curriculum focus e.g. for PSHE or SEAL. Each term we hold a service in church and also a service for the main Christian festivals, which the RE Co-ordinator and Church Clergy/members lead. Parents are invited to join us for these services and other assemblies throughout the year. Entrance to music – this may be quiet and reflective or praise, or music from different cultures. Prayer and reflection are an important feature of collective worship. Everybody is invited to prepare themselves for the way in which they want or pray, and join in with ‘Amen’. You can help your child to learn our school prayer which was created by children at our school. Bless our school, our teachers, our friends and bless each one of us. Always glad to help each other. There will be opportunities when, in silence or to appropriate music, everyone is able to reflect. The atmosphere at assembly is very important, the way that we speak to children, the way they are expected to behave and the way in which they come in sets the tone.